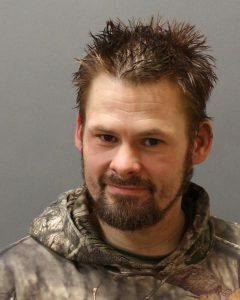 On March 26, 2019 at approximately 6:46 AM members of the Plainfield Police Department responded to an address located on Community Avenue in Plainfield, Connecticut for a report of a domestic altercation involving a male wielding a machete. The complainant identified the male as Accused, 37 year old Keith T. Coolidge. Upon officers arrival it was determined that Coolidge had left on foot and was described to be dressed in camouflage and a ski mask. Through investigation it was determined that prior to leaving Coolidge was banging on the windows of the residence with the machete and subsequently entered into the residence making threats to the occupants. The Plainfield Police Department subsequently requested mutual aid for assistance in locating Coolidge. Members of the Connecticut State Police Troop D and K along with Montville Police Department responded. Troop K and Montville officers on scene deployed their K9 partners and initiated a track of Coolidge. In addition, the Plainfield Police Department deployed their Inspire 1 Drone to search the surrounding area for Coolidge. Throughout the incident the Plainfield Police Departments utmost concern was community safety. All schools and public buildings in the surrounding area were notified in order to initiate their respective safety procedures. A NIXLE alert was released to the public which ultimately led to the locating of Coolidge by a concerned citizen who observed Coolidge in the area of Oakwood Boulevard. Upon officers responding to the area Coolidge was located in the woods and taken into custody without incident. Coolidge was transported to the Plainfield Police Department where he was charged with Threatening 2nd and Disorderly Conduct. Coolidge was held on a $25,000 bond and transferred to Corrigan Correctional Center awaiting his court date of March 27, 2019. The Plainfield Police Department would like to thank the community assistance and cooperation throughout the incident.